President Trump announced a ban on transgender people in the U.S. military on Wednesday. Here’s where Americans stand on a number of issues impacting the transgender community, including perceptions of discrimination. More Americans know someone who is transgender and understand the meaning of transgender than did several years ago. Today, more than one in five (21%) Americans report having a close friend or family member who is transgender, nearly double (11%) the number who reported having such a connection in 2011. Independents (27%) and Democrats (22%) are considerably more likely than Republicans (11%) to report having a close friend or family member who is transgender. Among religious Americans, white evangelical Protestants are the least likely to have a close friend or family member who is transgender — just 9% do. Additionally, today more than eight in ten (84%) Americans say they know what the term transgender means, a jump from 70% in 2011. More here. Most Americans agree transgender people face bias. More than six in ten (62%) Americans say transgender people face a lot of discrimination in the country today. Majorities of Democrats (77%) and independents (62%) perceive a lot of discrimination against transgender people, while only 44% of Republicans say the same. 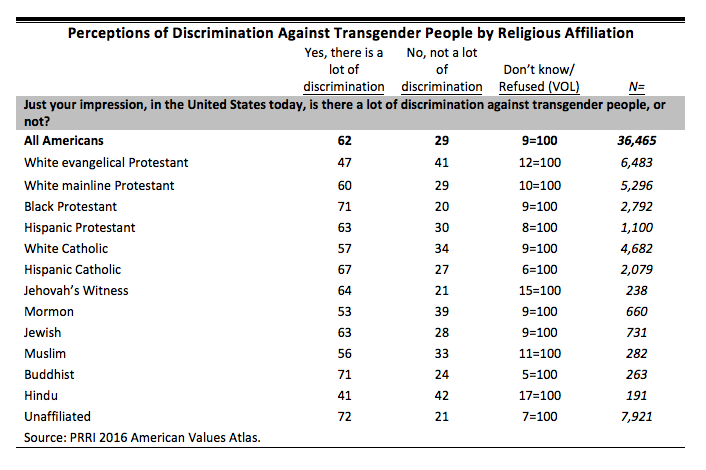 Among religious Americans, white evangelical Protestants (47%) and Hindus (41%) are the least likely to say transgender people face a lot of discrimination. More here.